OUR PRICE: $21.45 - Join Rewards Get $1 Dance Dollars On This Item! Simple and sweet. 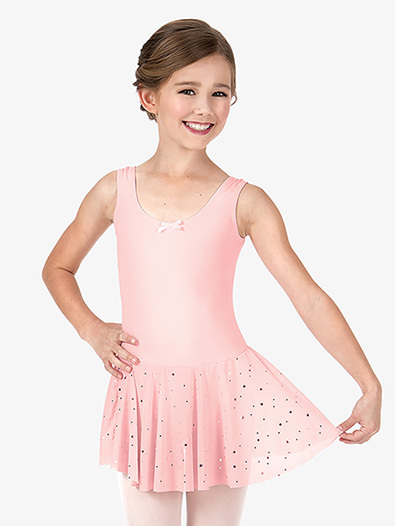 This tank dress features an attached mesh skirt adorned with silver foil stars and a small matching bow on the neckline. Dress is unlined. Bust 19"-20" 20"-21" 22"-24" 25"-27" 26"-29"
Waist 18"-19" 19"-20" 20"-21" 21"-23" 23"-25"
Hip 19"-20" 21"-22" 23"-25" 26"-28" 29"-31"
Girth 35"-37" 37"-39" 40"-43" 44"-48" 49"-52"
I bought this leotard for my daughter who is 5. I didn't measure her prior to ordering, but she is average height and smaller than average for weight. I ordered the Intermediate size and it fits her now but I think she will grow out of it faster than I had anticipated. Also, the front panel doesn't have any lining, so I worry that it may not be as durable as others we have purchased. But the style is very cute and the material is very soft. I like it overall but wish I would have ordered a size larger. My daughter fit the measurements given for the Intermediate size, and the leotard fits absolutely perfectly. 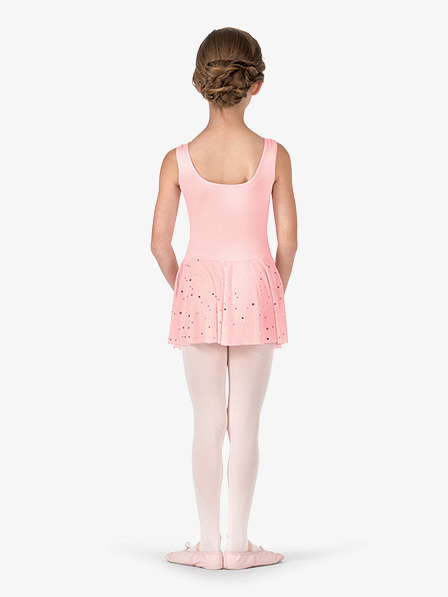 The skirt is a bit longer than on many dace leotards and I appreciate the option to have my six year old in something a tad more conservative.